Merry Christmas, everyone! I hope you all are enjoying a great Christmas holiday. I had plans to do a couple of posts each day here, but failed completely. Instead I’ve pretty much had a full week away from my laptop, staying blissfully offline. I had an awesome Christmas: hanging out with family, eating amazing food and getting great presents. It is still officially Christmas though, so I still have time to do some Christmas giveaways. Yay! 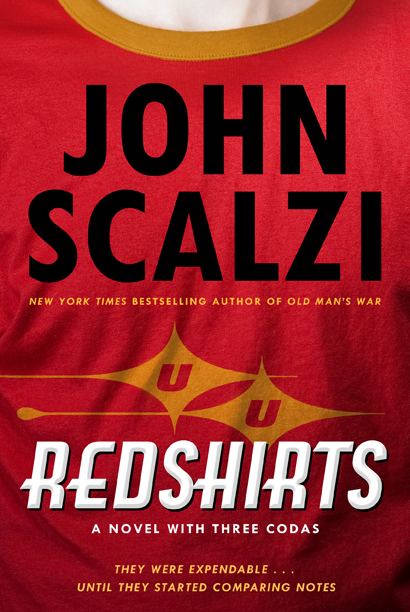 One of my favourite books this year was Redshirts by John Scalzi; it’s Must Read for every Star Trek fan. I’m so excited to give a copy away to one lucky reader! To enter the giveaway, leave a comment behind with your favourite Christmas present. You’ll also get a second entry if you’re following me on Twitter and tweet about this giveaway with the hashtag #missgeeky. The competition is open to everyone and will end on January 4th after which I’ll randomly draw a winner.